Yesterday marked 16 days since surgery and I had an appointment at the orthopedic surgeon's offices. I was nervous, because 9 years ago when I broke my femur, an orthopedic surgeon decided to first try manipulating the bone into position and setting it in a cast, no surgery. The hope was that nothing would shift out of place before the bone started to heal. That didn't work, the bone shifted, and after 3 weeks, I had to have surgery anyway. Add on a week until surgery could be scheduled, and that means I spent an extra month in a full leg cast and in a lot of pain. Not fun. I was nervous yesterday because there is a chance that the screws could get messed up. Apparently, if you have low bone density, until the bone heals/grows around screws/pins, there is a chance the screws/pins could shift or poke through the end of a bone and if that happened... well. Let's not go there. To our relief, the x-rays showed that thus far, everything is staying in place and the fracture is starting to heal. There looks to be a good amount of space from the end of the screws/pins to the end of the bone. They removed my staples and the incision looks good, just lots of bruising still. My next appointment is in 2 months, and so until then, I must take it easy. It's pretty frustrating because it's summer and I want to be outside, at the Arts Festival, at Pirates games, seeing movies, going out to eat, but I know if I go out and something happens, I'll be devastated. Many people seem to not really see me in the wheelchair and trip over me/plow me over and I do not want any mishaps. Better to 'give up' up one summer than a summer and fall and maybe even more. Besides, once the HHH days of summer kick in, I'll want to hide inside in the a/c anyway! When SP & I got home, we shared the good news with my mom. She was very relieved, and then she went to the refrigerator and brought out treats for us. She said she had stopped at Market District for a little dessert to celebrate the good news. Or, as she also said, a little dessert to cheer us up if there was bad news! So she bought 'dual purpose' dessert - cheering or consoling! She got mini fruit tarts for her and SP. 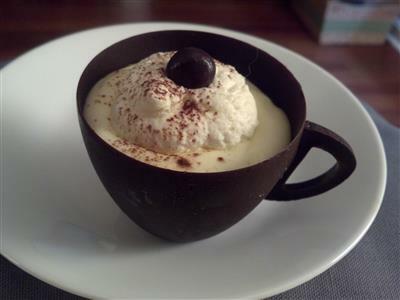 For me, she bought this adorable chocolate teacup filled with tiramisu. It was so cute I didn't want to break it, but once we settled in to watch another episode of 'Downton Abbey' (SP and I are zipping through Season 1 - love the show! 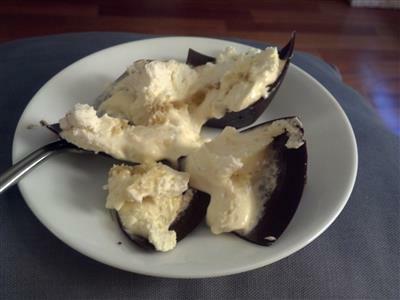 ), I had no problems breaking the chocolate teacup. 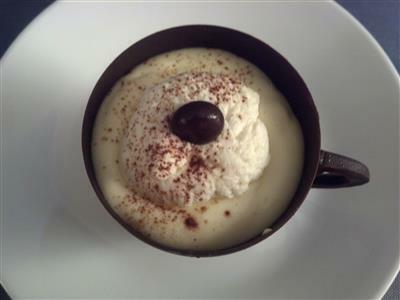 It was a very tasty, if chocolaty, dessert, but mostly I am happy it was enjoyed as a celebration and not a consolation.